So, remember when I posted how I’d finished cutting out the last bits for Tyo’s bunnyhug and had enough fabric left for her pair of shorts? Well, as soon as I finished cutting them out, I had a little niggle. What if. What if I messed up one of the pieces? What if I have a serging accident? I just officially used up all but the smallest scraps of my matching fabric, with no hope of replacing any of it. Well, when I finally started tidying up, guess what I discovered? 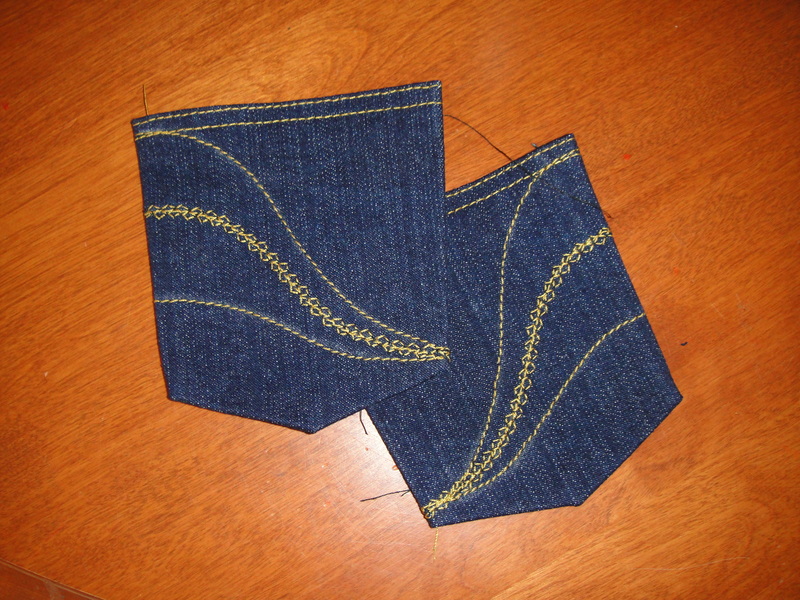 One more pattern piece for the bunnyhug, which I hadn’t cut out. 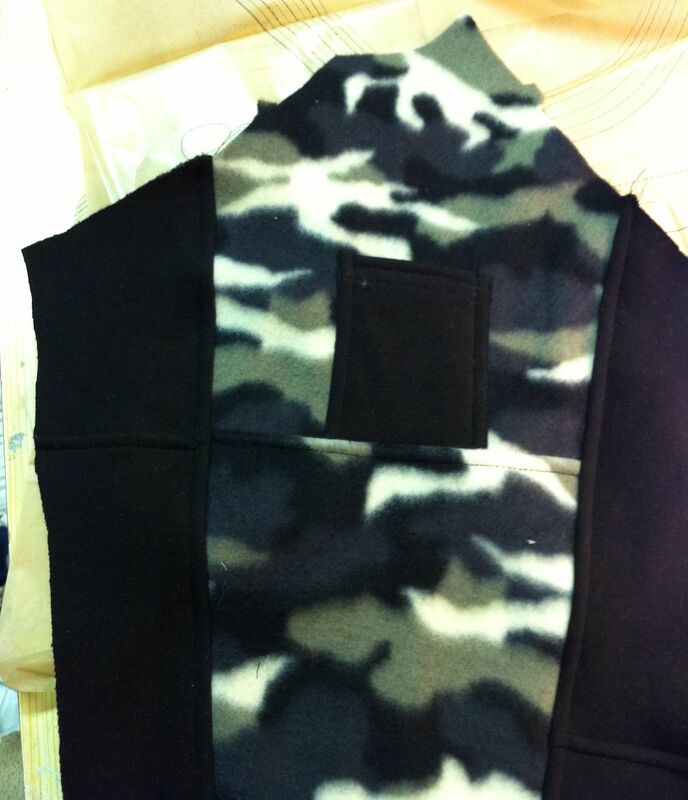 Not only that, the single longest pattern-piece in the entire pattern, the sleeve sides. Of which I need not one, not two, but four copies. I think there’s a sequence to this, kind of like the stages of grief. Denial—maybe I took the pieces off the pattern and they’re kicking around somehwere? Anger—how could I do this? Oh, I’m so stupid. Bargaining—maybe I can match in some other fabric? What about the scraps from hubs’ coat? no? Fortunately with sewing, at least, there’s the potential for action, not just acceptance. I gathered up my largest remaining scraps (most of which weren’t more than 6″ in any given direction. I roughly, ever so roughly, matched the grain-lines. 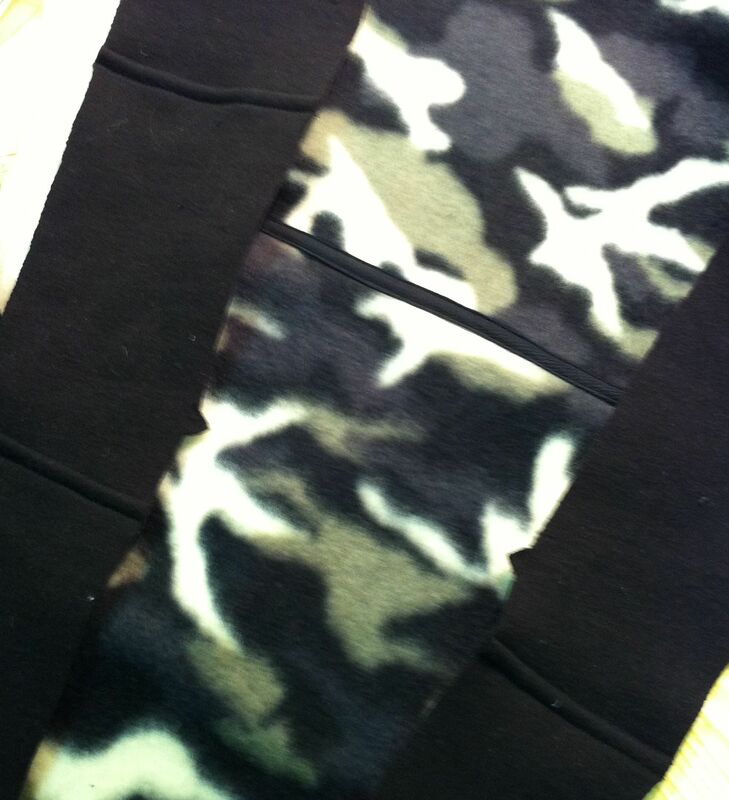 And I pieced them together, using the same serge & topstitch methodology I used on Tyo’s shorts. This was a wild affront to the sewing gods, peeps. If I die in a freak serging accident next week, you’ll know why. 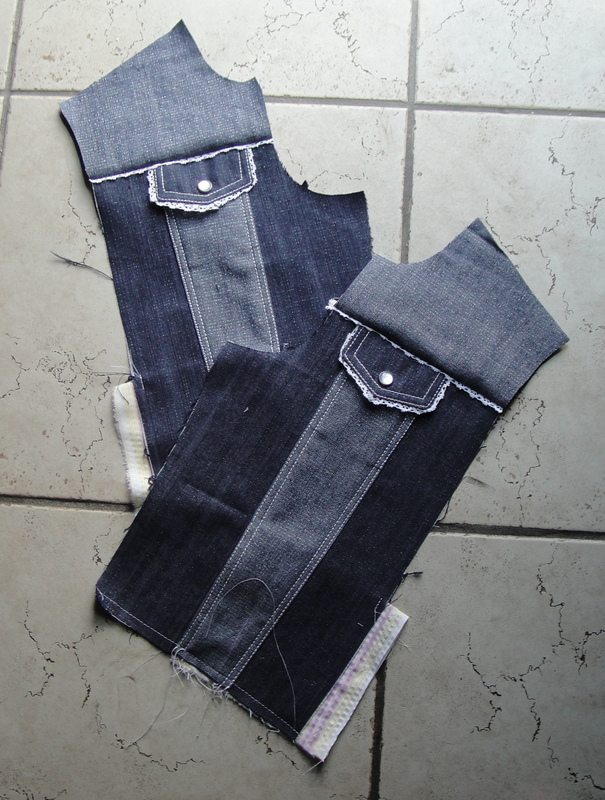 And I cut out not one, not two, but four side-sleeve pieces. I’m actually pretty satisfied with how they look. Not exactly intentional, but not exactly unintentional, either. I used some black twill tape to cover over the seam on the top part of the sleeve, which echoes the topstitched ridges in the black nicely, I think. This is the same method I used for Syo’s hoodie here. 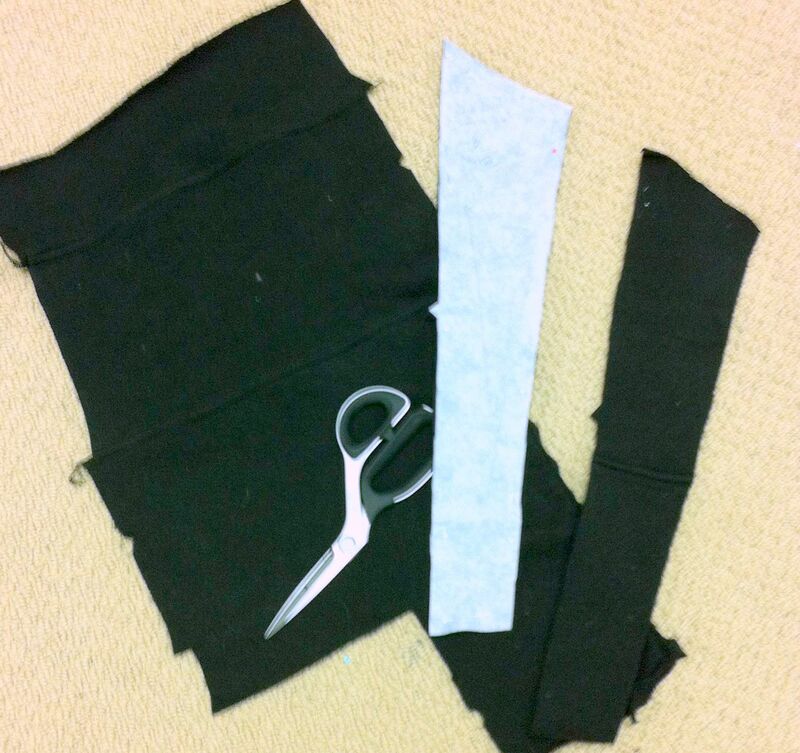 For the other sleeve, I decided to add a little pocket just above the top-sleeve seam. The sleeves on this jacket are driving me nuts! Is it me? Is it the pattern? 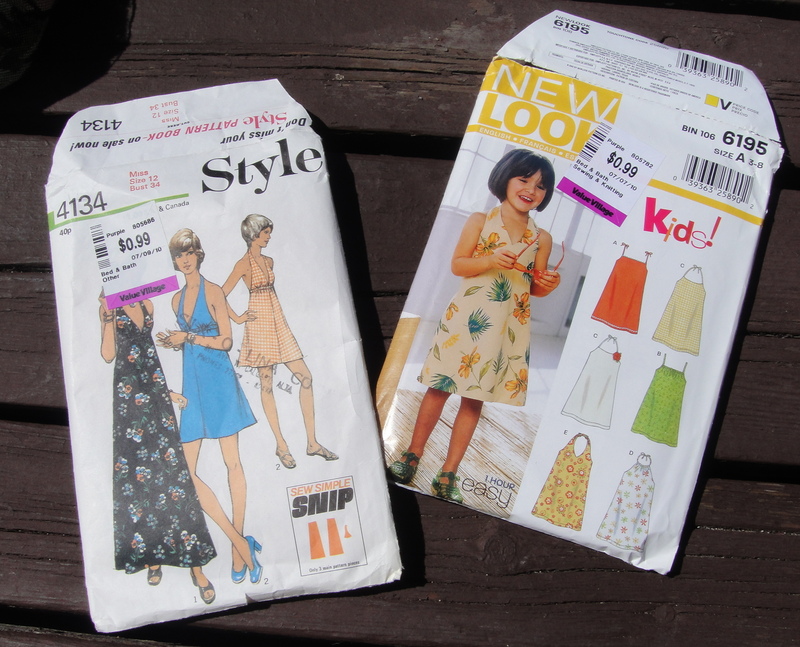 Is it my punishment from the fickle Sewing Gods for daring to try to make a—ulp—petite pattern? Part of the problem comes from the shoulder seam, which runs well to the rear of my actual shoulder. Actually, the neck-side of it is perfect. But for some reason it angles backward at the outside. (I had noticed this in the muslin but thought it was due to me distributing the fullness of the sleeve cap poorly. Now I suspect that this is WHY the fullness was all concentrated to the back. Also the shoulder seemed a bit too wide, especially at the front, and I’ve now tightened the curve of the front princess seam a bit. I am dangerously close to the kind of billiard-ball alterations that turned my Lydia Disaster from a well-constructed top that didn’t happen to fit me into something suitable only for my 10-year-old’s scissors. But wool is considerably more forgiving of stitch-ripping than a cotton knit (I’ve now had sleeves basted in at least five separate times, by machine and by hand… I like by hand, it only takes about 2 snips to rip it all out). I’m hoping if I give up on the shoulder seam as a reference and mark my actual shoulder point, I’ll have some better luck. I hope so. I sure love this fabric. Seriously, though, this is a pain. I have pretty easy-to-fit shoulders. They’re a little broad (not for this pattern though!) and square, but they’re straight and even. No forward-shoulder alterations here. And I’ve set in plenty of sleeves before, even in jackets, with none of these problems. Man, I wish I had a dress-form. 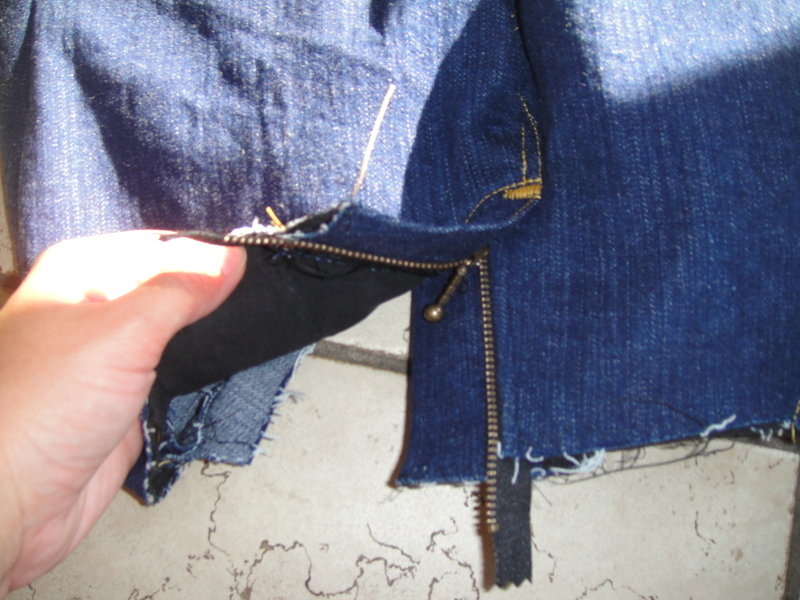 Adjustment intended to raise the centre back of my jeans. So after the last time I made up the Jalie Jeans, I decided the back really was too low and that I should raise it. So I took my pattern and slashed and pivoted to raise one side. Those of you who are keener observers than I will realize that the side I expanded is the side seam, not the centre back seam. Therefore it does nothing to the centre back, and plenty to throw off the side seam. Aren’t I brilliant? I think I’ll be able to make it work by shaving off the top of the yoke, but man… I am severely choked with myself. On the other hand, by following Debbie Cook’s tutorial step-by-step, I managed to install my first “perfect” fly. I really don’t do well with video tutorials like the Sandra Betzina one, oddly. I think I find it harder to keep my place in the process, or I miss steps as my mind wanders. Redemption is a perfect fly? Unfortunately it’s adorned by some of my least-perfect top-stitching, but ah well. I rather like my pocket design. I don’t have any real transfer paper, so I improvised with sidewalk chalk on a sheet of regular paper. It was rather messy, but worked well enough for my simple pattern, and it seems to have all come out. I also experimented with one of my few fancy stitches. I really like this denim, though—it’s both heavy and stretchy and soft, a good combination, I think. Now if only I hadn’t f#$%ed it up! Black halter top... so close! There is a significant gap where the buttonhole side is longer than the button side. WTF? The pattern pieces were identical, I promise you. 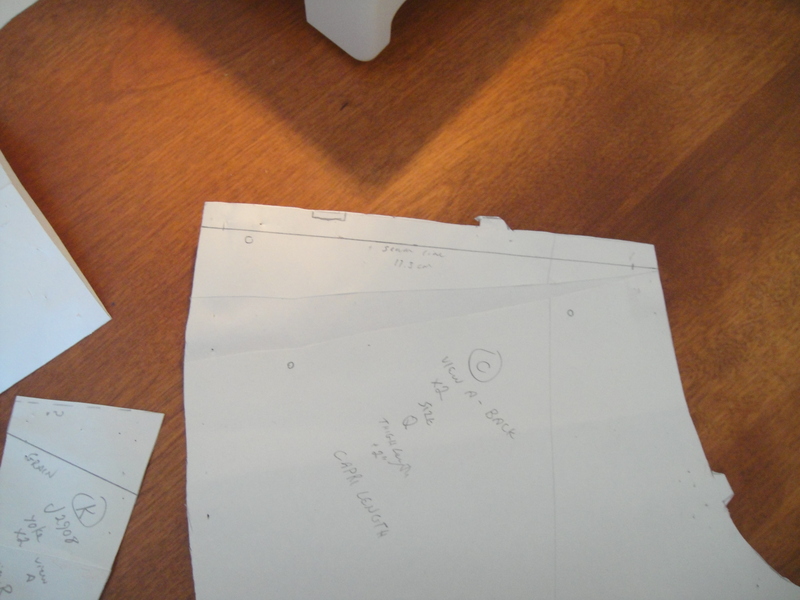 Were the top parts sewn asymmetrically? Possibly, but not by the inch-inch and a half that they’re off. No, the culprit in this case is my eyeballed hemming. For some reason when I was ironing the hems I couldn’t find the little hem measurer that I keep downstairs with the iron, so I eyeballed it. Not un-fixable, but yet another seam to rip out. Maybe I’ll remember to pick up a seam ripper today. Like my buttons? Unlike my uneven hems? But the shirt as a whole is looking pretty good, if a little scanty in the bottom-half coverage. I’ll have to think about drafting that downward dip in the front that was there in my original drawing. Do YOU see what's wrong? I would be less ticked if I hadn’t broken my seam ripper last week, and forgotten to get a new one when I picked up thread this morning. Curse the Fabricland 50% off sale! It always strikes right AFTER I’ve spent my (non-existent) fun money. But, this time I bit the bullet. 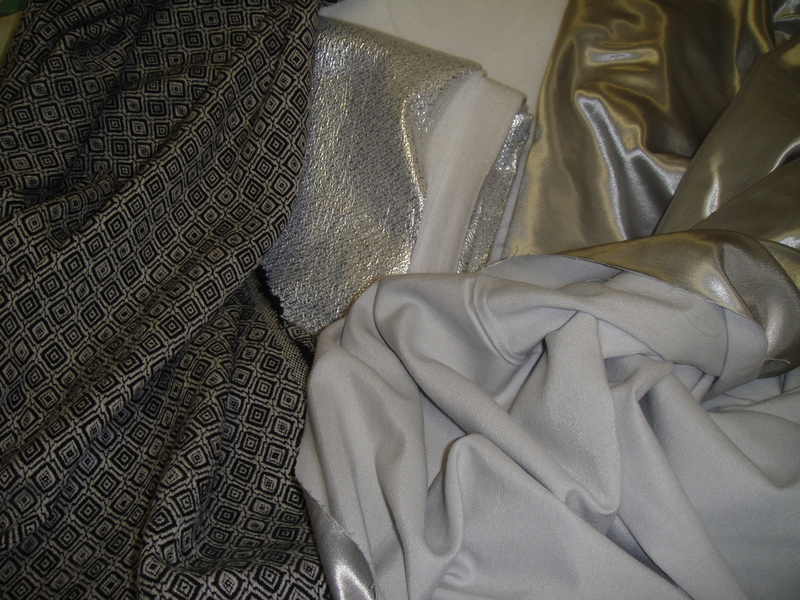 I got the remainder of my coat materials (lining and interlining… even at 50% off, 5m of Kasha lining still adds up). I got a metre each of two different kinds of insulating underlining, one with a fancy silvery side to reflect heat, one which is just plain white. 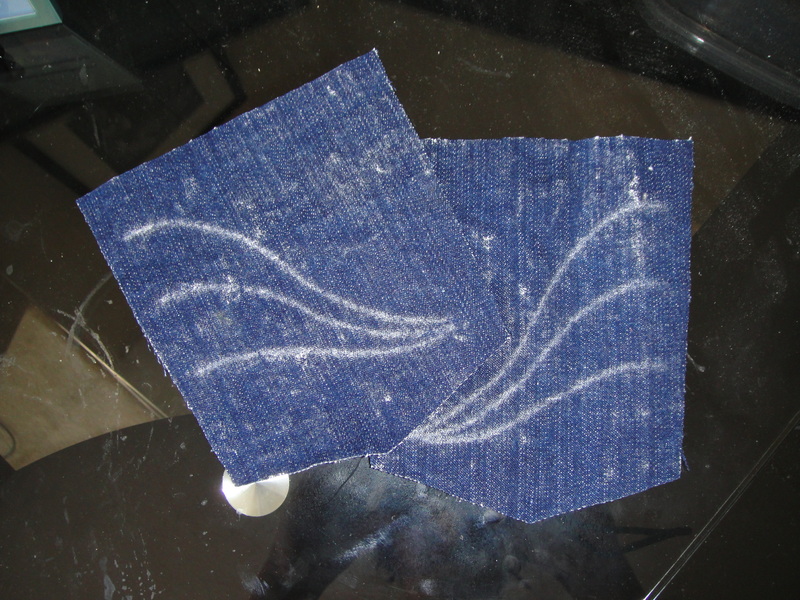 Neither is very thick; they’re not at all drapy, but I think they’ll be fine in the bodice and maybe sleeves. I’m thinking the reflective one for the bodice and maybe the plain white for the sleeves if I think they need it/can take it. And I gave in and got the grey Kasha. They didn’t have black, and I didn’t like the two possible colours, a dull dark blue and a very orangey red, that they did have. I love red, but I like my reds deep and possibly leaning towards maroon. Not orangey. So pale grey it is… though I will probably regret it when it gets incredibly dirty after a few weeks of wear. Anyway—excited to have progress (however expensive) on that front! Cottons for unselfish sewing: (clockwise from upper left) print poplin, white crinkle voile, pink poplin solid, yellow stripe "seersucker"
I also picked up some lightweight cottons for my unselfish-sewing. Ugh. 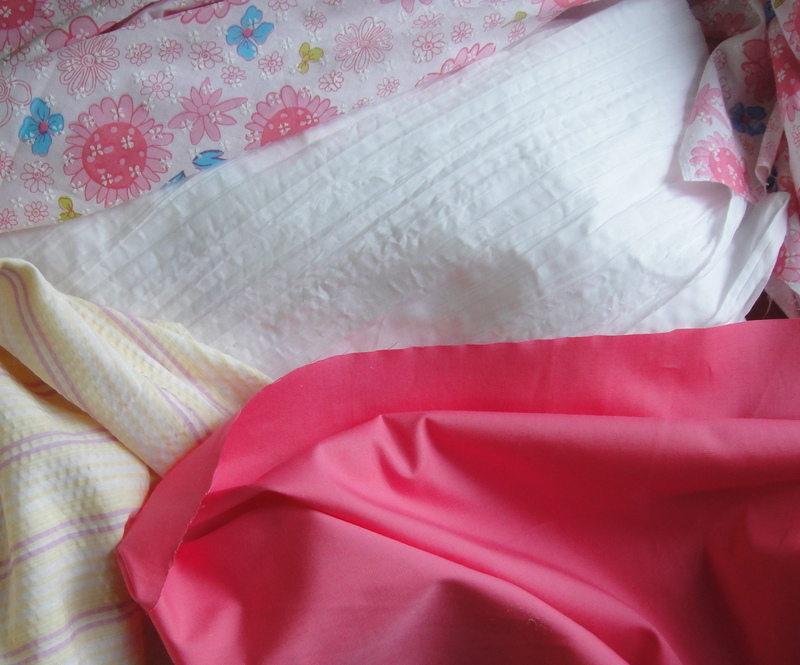 A pink solid and pink print of cotton poplin (somehow I thought poplin was heavier, but this is what the bolts said), for the one niece, and a nice yellow striped seersucker-looking thing from the bargain centre for the other (who doesn’t have to live in pink all the time). I would’ve liked a cool, edgier print… maybe little skulls with bows or something—but this was what they had (and lots of other, even more nauseating, prints). 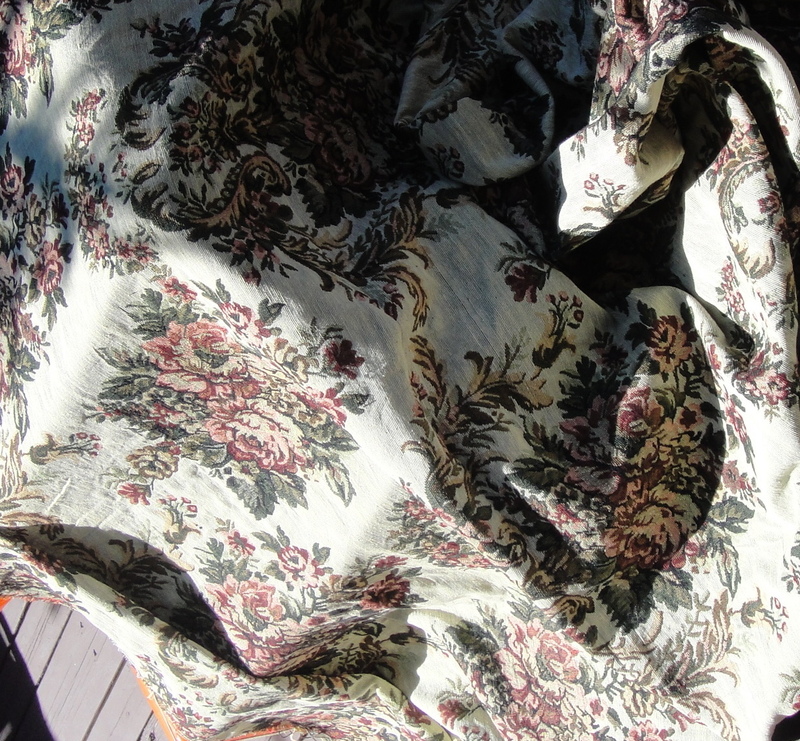 The white is a crinkle cotton voile I will use for the hubby’s flowy overshirt. I resisted the denims staunchly.